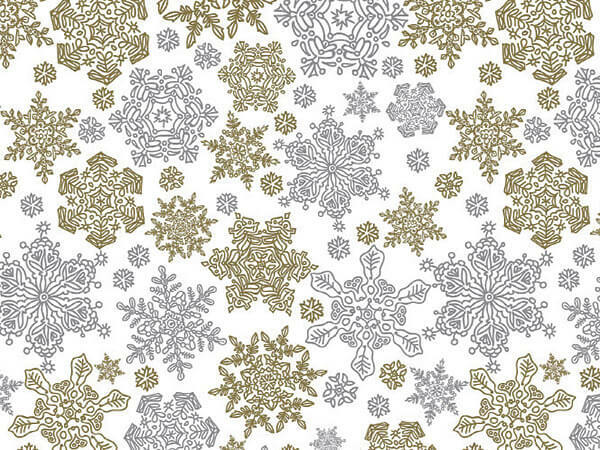 Metallic Frozen Flakes has beautiful gold and silver snowflakes on a white background. These intricate snowflakes are a classic design for Christmas gift wrapping. These large 30"x150' rolls are great for your store supply of wrapping paper. Our wholesale prices make it affordable to stock up on multiple designs! Our metallic gift wrap is not foil, but a high quality, heavy weight metallized paper! The quality of this paper means you cannot see though it and you never have to worry about it ripping or tearing during use! Made in the USA. Metallic Wrapping Paper comes in many prints perfect for any holiday or celebration! We have giftwrap that is traditionally Christmas and designs that can be used for weddings! These wrapping paper rolls are all 30" wide and are offered in a 50' roll or a 150' large roll! These papers are metalized heavy weight paper, so they offer great coverage for your gifts! Made in the USA!